In our May issue we report on the 2014 V-Strom 1000 at the press launch from Almeria, Spain. 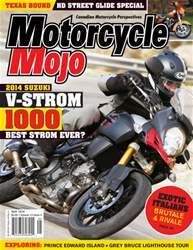 Could this all-new V-Strom be the best Strom ever? Heading to the south of France brings us face-to-face with the new MV Agusta Rivale 800 and the Brutale 800 Dragster where we experience both on the street and the track. In true Italian form, these two beauties won our hearts. Back on North American soil we have a test of the 2014 Harley-Davidson Street Glide featuring many upgrades from Project Rushmore. Our three travel features in this issue find us in Prince Edward Island, on a lighthouse tour on the Bruce Peninsula, and an escape to Texas from a bone-chilling Canadian winter.